In this digital economy, organizations are looking to technology as a competitive differentiator in driving higher engagement with customers, enabling new business models and staying ahead of the competition. CIOs are at the core of the transformation agenda, balancing between operational efficiency and forward thinking projects. In both instances, servers are the bedrock of the modern software-defined data center and the key to building a flexible, efficient and cloud-enabled infrastructure. Dell EMC PowerEdge servers powered by Intel ® Xeon ® processor deliver a worry-free infrastructure that is secure and scalable, with no compromises. 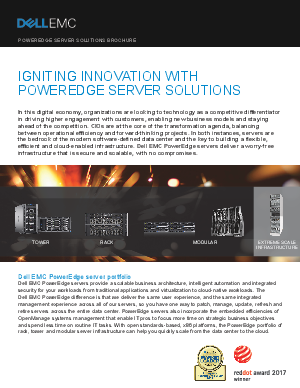 Learn more about Dell EMC enterprise solutions in collaboration with Intel®.